I got so much knitting done on this sweater sample over the weekend. I'd wanted to get to the bottom ribbing, and I'm still an inch and a half away from that, but I still powered through it. Of course, it helped that I had a three-day weekend, and that I was home sick yesterday coming down from a bit of overnight hyperglycemia, but I still feel like a knitting CHAMP. 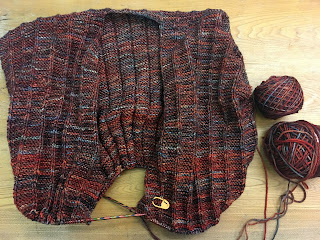 My hope is to bind off the body by the weekend. My brother has a show choir competition on Saturday, and I think I'd like to bring the Linney that was supposed to be my NaKniSweMo project, before it got set aside so I could reknit Delwyn. Right now, Linney is only a couple inches of ribbing, so it's nice and portable and should be easy to work on in the auditorium. Over the weekend I finished both The Nordic Theory of Everything and Get Well Soon. I've started Miracle Cure and Finding Sisu, and I'm really enjoying both of them right now. I still have quite the stack of library books in my apartment, but hopefully I can keep chipping away at it and get my to-be-read pile down to a more manageable level! Your sweater is looking SO good! I love the yarn you chose. What did you think of The Nordic THeory of Everything? It was really good! There were some parts that were SUPER hard to read, just because even though I know that the US system is absolutely the worst, reading about an outsider experiencing it for the first time is SUPER STRESSFUL.